I’d like to paint a picture of where my head was on Friday night. I had been up since 5 a.m. and taken a more efficient version of Planes, Trains and Automobiles to wind up at the Illinois/Iowa border, so when, four songs into the set, the thought is that I must really be experiencing that complete mental escape from reality that comes via total sleep deprivation aided by alcohol and red meat, because they just played “Sometimes” and “Hail, Hail,” and goddamn it if they’re not playing “Who You Are” right this second, and that’s the first three songs off No Code in sequence, and all this is followed by “In My Tree,” and my god, either I’m having a stroke or I’m already dead, but Pearl Jam is, without warning, in front of 12,000 similarly delirious fans in Moline’s iWireless Center, playing this album in its entirety. I had flown from Boston to Chicago that morning, met up with a similarly minded maniac friend in the city, hopped in a rental car and drove close to three hours to get to Moline, a city of about 40,000 folks, home of the John Deere Pavilion and part of the Quad Cities along with Rock Island on the Illinois side, Davenport and Bettendorf across the Mississippi River in Iowa. My friend had an extra ticket, and with the promise of a small venue and the buzz that was likely to come with band’s first performance in the area, everything was booked and we were off. We, and certainly most of the folks we saw lined up hours early for general admission seats and merchandise, expect the unexpected. Bizarre, rotating setlists are typical for the band at this point. The live staples sit alongside b-sides and covers, no two nights are the same and fans spend time trying to guess openers and making requests online. But even for such an unpredictable band, the thought of just throwing an entire album into the setlist, with no warning, was a stunner. And No Code was a perfectly atypical album for this atypical tour stop. The record served as something of a dividing line within the fan base for years. It worked in paring down the number of people interested in the band, but it also reinforced the bond between the group and those that connected with the the album. The music of No Code and its subsequent (lack of) promotion were both direct jabs at the ultra-commercialism the band fought following their volcanic rise, and so if they were to play it again — and play it for the first time in full — it’s fitting that it happened in this small town and in the smallest venue on their 2014 schedule. The record bounces from hushed moments to screaming rants; the soft opening of “Sometimes” leads to a stunningly loud “Hail, Hail” that had listeners throwing off their headphones in 1996 and audience members leaping out of their seats in 2014. The somber, contemplative mood of “Off He Goes” caps the first half of the record — Eddie Vedder noted “End of side one” after the song, his only acknowledgement of what was happening while they played the album — and is usurped by the blinding punk frenzy of “Habit.” Here, Vedder was screaming and hanging from the mic stand while Mike McCready nearly burned a hole through his guitar, stage right. Starting the show with the appropriate “Elderly Woman Behind the Counter in a Small Town,” emphasis on “Small Town,” revealed that this crowd was filled with the right kind of lunatics who would be more than receptive to hearing their anti-commercial totem in total. The crowd went from merely singing along loudly to screaming the words back to the band, climaxing on the “I just want to scream, ‘hello’” lyric. When the band shifted gears into No Code and the crowd realized what was happening, each song seemed to get a louder and louder response. The crowd bellowed along again with “Present Tense” and went collectively mad during the song’s closing jam, and then greeted Stone Gossard’s turn at the mic for “Mankind” with nothing but extreme reverence. By the time “Around the Bend” capped it all off, the punch of “Given to Fly” broke through the haze of having seen something so unexpected and unique. And more than half the show was still to be played. The specialty of this night wasn’t limited to merely playing this gem of a record. 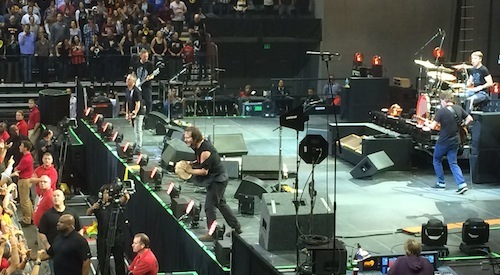 After “Mind Your Manners,” Vedder began taking signs from the crowd and started pulling requests, leading to rare performances of “Brain of J,” “Gone” and “Garden.” Wedged in between was a searing edition of “Even Flow” that featured some of the more intense McCready guitar playing of the night, with the speeding solos traded for just mean, screaming chords and runs, a logical extension of some of No Code’s more extreme moments. I haven’t had much exposure to the midwest, and practically none outside of my few trips to Chicago and one train ride that ran through Ohio and Indiana while I was half-asleep and trying not to be noticed by some of the weirdo grifters on the same trip. But an overwhelming and nearly universal politeness coupled with lots of good food and great local beer at prices that were shockingly low for someone who lives in a relatively expensive city worked to convert me. The stunning visual of miles of flat cornfields is no match for good people and good food. The band must have picked up on the same vibe. To start the first encore, Vedder debuted a new song written for Moline played solo acoustic before bringing Jeff Ament out for another rarity, “Bee Girl.” And there were more songs that capitalized on this far-flung locale, with “In Hiding” and “Why Go” feeling right at home. A cover of John Lennon’s “Imagine” turned into another mass sing-along. The buzz didn’t wear off after the show. Those 12,000 folks floated back up the aisles, down the stairs and out the doors, flooding the parking lots, trading favorite moments and reveling in the afterglow of an incredible performance. It was a night designed for this place. It couldn’t have happened anywhere else quite the way it happened here. We made our way to our hotel and I was still on some sort of bizarre Pearl Jam geek high, running songs and setlists through my brain in an attempt to put the ridiculous display in perspective: why they would have chosen this night to play a personal favorite to completion, why my friend chose this show, how the second ticket opened up, what made me buy a plane ticket, how I had managed to be in my seat on Stone’s side of the stage to witness it, what was running through the band’s collective minds when they slammed into “Brain of J” or “Interstellar Overdrive,” because I know that mine was on overdrive and short of sleep trying to process how I had woken up in Boston and gone to bed on the Mississippi River and whether I’d gotten enough down in my notebooks before I passed out and whether those memories might be lost and gone forever. When I woke up, I got dressed and went down to the lobby for some coffee before driving back to Chicago. We couldn’t stop talking about the show, breaking it down and volleying in excruciating detail. We were leaving, but the memories were safe. I knew where I was. I could never forget it.